A team of scientists at the University of California, Riverside have successfully developed a genetic map of the cowpea. This development will enable further research into new and more resilient varieties of this staple crop, which is grown throughout many regions of the developing world. Mapping the cowpea is notoriously time-consuming and difficult. But now production plans of new and improved cowpea varieties can begin to take shape. Continued development and research is a key part of the Farming First plan (read more about our sixth principle, which is to prioritise research initiatives). To build the map, the scientists first modified and then applied advanced genetic tools developed from human genome investigations that only recently have been applied to a few major crop plants. The consensus genetic map of cowpea is a dense and detailed roadmap of its genome (a genome is a complete genetic blueprint). The map has approximately 1000 molecular markers throughout the genome. The markers, which are like signposts directing a motorist to a destination, are associated with traits desired for breeding and used to more deliberately design and assemble new superior varieties. 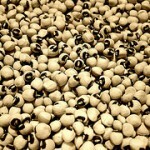 Cowpea is a staple for maize- and rice-based diets in Latin America and drought-prone areas such as Africa and Asia.